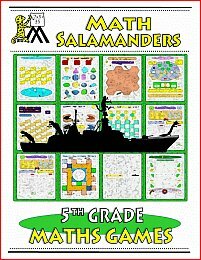 Welcome to the Math Salamanders Math Games Fifth Grade. Here you will find a wide range of free printable Math Games to help your child learn their Math facts at 5th grade level. Have fun using these free 5th Grade Math Games...we hope you enjoy them! 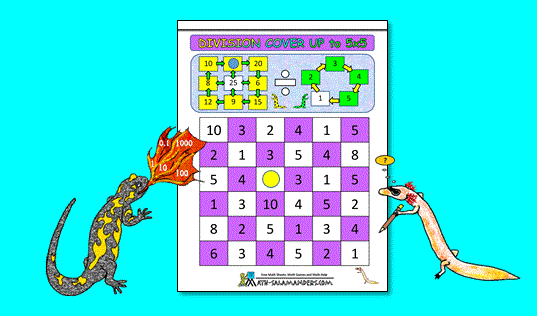 Our 5th Grade Math Games e-booklet contains our entire selection of printable math games for 5th grade. There are a total of 27 games designed for specially for 5th graders. There is a wide selection of games to develop a range of math concepts from decimal place value to addition, subtraction and multiplication to geometry, fractions, money and strategic thinking. Use the link below to take a peek! Fraction Classify It is a great game for getting children to develop their understanding of fractions, and how fractions relate to division. The game also different math vocabulary such as prime, equivalent fraction, improper fraction. It also helps to develop an understanding of equivalence of fractions, decimals and percentages. Decimal Digit Dilemma is a game which uses digit cards to try to create a decimal number with certain properties. The aim of the game is to be the player that has got closest to an agreed target. It is a great game for developing an understanding of place value up to thousandths. 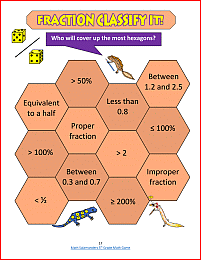 Salamander Fraction-Decimal game is a game involving converting fractions to decimals. As you play this game you will become much more confident and able to convert a range of fractions into decimals without even thinking. It is also a strategic game where you have to try to win the game for yourself as well as trying to stop your opponent winning. Learning: converting a range of proper and improper fractions into decimals. SSalamander Multiplication 2000 Game is a multiplication game which will help to develop children's understanding of multiplying 2 digits, but also rounding and estimating calculations. The aim of the game is to use your digits to make a product as close to 2000 as you can! This is also a strategic game, because you receive your digit cards one at a time, and you have to make a decision about the best place for each card to go. You cannot move a card once it has been placed! For this game, you will need a set of digit cards per player. Learning skills: multiplication, rounding and estimation. Decimal Tables Challenge is one of our Math Games Fifth Grade that uses the multiplication tables and an understanding of decimals to make different decimal numbers on the board. The aim of the game is to be the first player to get 4 counters in a row. 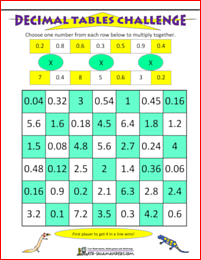 The PEMDAS rule game is a game which involves using brackes, multiplication and addition or subtraction. The aim of the game is to place digit cards in the pemdas game boards to get as close to the given target as possible. Learning skills: learning the PEMDAS rule and reasoning skills. Three on Target Game is a board game that uses dice to generate random numbers. The numbers are then used to try to create target numbers on the board - some of which include negative numbers and decimals. The aim of the game is to be the first player to get a triangle of 3 adjacent counters. Spot the Calculation is a good game for developing mental calculation skills using all 4 operations. 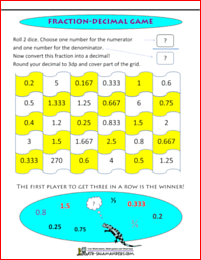 The aim of the game is for one player to make a calculation using the numbers on several dice. The other player then has to try to guess what the calculation was from the answer. Bang on Target is one of our math games fifth grade which helps to develop mental calculation skills. 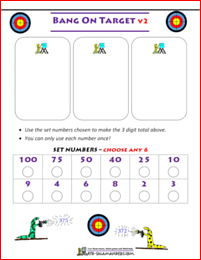 The aim of the game is to use a set of numbers to get as close to a target number as possible. For this game you will need a set of digit cards, or a ten-sided dice, and some counters. Learning skills: developing mental calculation skills. 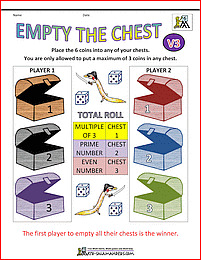 Empty the Chest is a fun probability and chance game that involves strategically selecting chests to put coins in. Roll the dice and see which chest you can take coins out of. The strategy involves selecting the chests with the highest probability of rolling to put your coins in. If you are looking for some easier games, then why not try these math games for 4th graders. If you are looking for some more challenging math games, then why not try these math games for 6th graders. Many of the games are similar to those on this page, but at a slightly higher level.